Great news for those who are into visual corpus linguistics but don’t work on SAE languages: since July, Wordle handles alphabets in the Extended Latin ranges; and today its maker, Jonathan Feinberg, added support for combining diacritics. That means that you can now feed Wordle texts from languages that use tone marks and other diacritics in their orthographies. Like Siwu. Wordle based on some ten minutes of spontaneous conversation in Siwu. Things this Wordle cannot show is the relative differences in conversational strategies of the participants. Mr. Orange, for example, as I call him in my ELAN transcript of the conversation, is by far the main supplier of mm and its cousin m-hm; in fact his repertoire is not much bigger than that — rather than doing the talking he prefers to have a supporting role in this particular conversation. The three others are much more vocal and varied, not to mention much more expressive (ideophones are sprinkled all over the place!). But that’s all for another occassion. For now, cheers to the new Wordle! 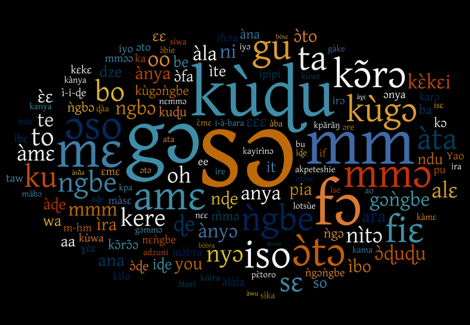 This entry was posted in Linguistics, Siwu, Software, Visualization by mark. Bookmark the permalink. Given a modicum of programming or unix tool mastery, you could create input for the http://wordle.net/advanced page, which permits you to assign colors (and weights) to words. That is very cool. That way it would be possible to give the participants different colours. In fact there’s a whole vista of new visualization possibilities there!